The 2018 Brico Cross stop in Lokeren today certainly delivered plenty of drama, but not the kind most cyclocross fans crave. While the event was just a UCI C2 race for the Elites, held just one day before Sunday’s start of the Superprestige series, many big names took the start of the Brico Cross event to put on a show and perhaps use it as an opener for Sunday. For one big star, that decision would prove fateful. 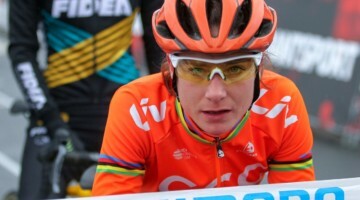 In the Elite Women’s race, after an Ellen Van Loy (Telenet Fidea) holeshot, Sanne Cant (IKO Beobank) resumed her winning ways after Marianne Vos disrupted her season’s momentum at Brico Cross Hotondcross. The course featured a wooded, undulating course, one sand pit and multiple ditch crossings, not unlike the infamous wheel-breaking one in Reno, but deeper and without the rocks. Cant was patient for the first half of the race, following Laura Verdonschot (Marlux Bingoal) before putting in an attack. Verdonschot rejoined, as did Loes Sels (Pauwels Sauzen – Vastgoedservice), but on the final lap Cant surged again, and this time kept the gap for the win. The top three made for an all-Belgian podium. In the Elite Men’s race, the race started off as expected, with Mathieu van der Poel (Corendon-Circus) and Wout van Aert (Cibel-Cebon Offroad Team) battling for the holeshot. However, the course’s ditch may have buried at least one former world champion’s season. 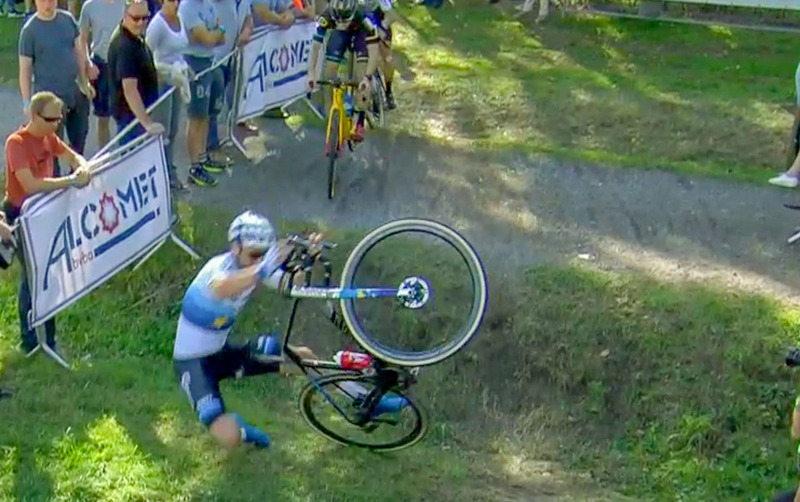 Van der Poel landed awkwardly after the drop-off, rolling his right ankle. The cyclocross fan base gasped as Van der Poel could not walk it off, let alone resume the race or his undefeated season. He briefly tried to rejoin the race, but had to one-leg pedal off the course. 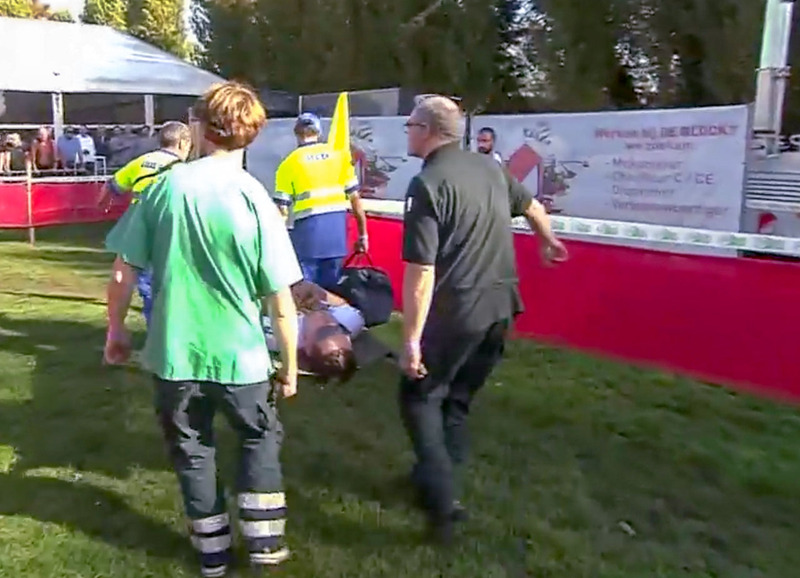 The Dutch star appeared to injure his ankle or achilles, and had to be removed from the course on a stretcher. 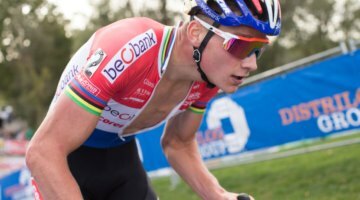 Update: According to gva.be, Van der Poel’s initial diagnosis is a sprained ankle, not a fracture as originally suspected. Van Aer seized the chance to take control of the race, but his chances of victory fell into a hole as he flatted and shot backward through the field. Daan Soete (Pauwels Sauzen – Vastgoedservice) escaped such misfortune, and kept it smooth ahead of a chasing Telenet Fidea train to claim victory. Teammate Laurens Sweeck outkicked Toon Aerts (Telenet Fidea) for second. Van Aert chased furiously after a bike exchange, and even looked to be bringing back Soete after moving up to second, but then faded dramatically on the final laps to finish sixth. 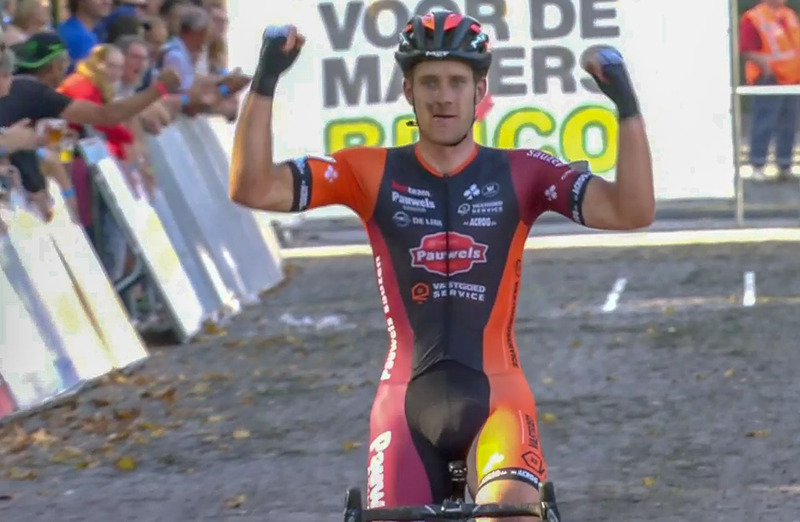 Daan Soete wins the 2018 Brico Cross Lokeren. The Brico Cross Lokeren stop also featured UCI Junior Men and U23 Men’s racing. Joran Wyseure and Toon Vandebosch took the wins in the Belgian-dominated events. Great Britain’s reigning Junior World Champ Ben Tullet took the start, finishing eighth.